Our Oceans and Cryosphere Centre includes law, policy, observational oceanography, ocean modelling, and cryospheric research. We lead Australian research in blue-water oceanography and postgraduate training. We work in the Antarctic, Southern Ocean and temperate oceans. Many of the studies undertaken have global scale and frequently contribute to the latest climate change assessments used in the reports of the Inter-governmental Panel for Climate Change and the Antarctic Treaty Consultative Meetings. We report our research in peer reviewed literature, conferences, news media and social networks. 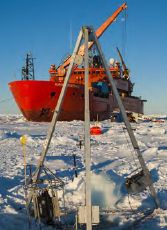 The four key activities in this centre are: Antarctic and ocean governance; physical oceanography; bio-geochemical oceanography; and, marine geophysics.